30 Responses to "BODYCOMBAT 52 tracklist"
Thanks as always Glenn, hope you guys has an amazing honeymoon ! Who the presenters for Body Pump 83 & Body Combat 53 were?? Combat was just D&R, pump had a whole swag of presenters, and some shadowing too – I can’t actually remember them all to be honest! Track 4 sounds EPIC!!! Loving the track! Track 6, however, REALLY!? Now, I don’t mind Beyonce, but Ring The Alarm is a seriously bad song! Just plain annoying! Agree totally! The sing along tracks destroy my Combat attitude – prefer techno or rock! Full playlist with original songs!!!!! No, no, no 😦 This is a fight class, why cant there be propper music, and with that I mean rock??!! Let Bodystep etc take care of the annoying trance/techno. My ears are bleeding. Release 51 had 3 rocksong, which made it my absolut favourite release, thats the way to go in the future as well. Who has time to sing along when your lungs are exploding. My class hate the cheese and just want to graft in body combat, it should never be easy. The last few releases have been hard as nails and that’s the way it should be. The rock tracks make you feel more like a fighter, hope they stay with the rock and no more circles. Guess that’s the great thing about having different instructors is that peeps can pick and choose the ones that play the music they love! That truly is a good excuse, haha! Thanks for the tracks! Love number 8 and 9! 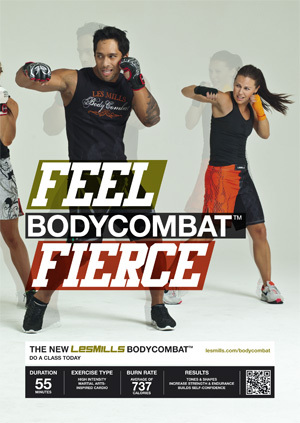 Can les mills never choose completely different music for some of the other classes like body pump etc, there is always 1 or two songs that are the same. I’m going to be sick of bring me to life my the end of the release. Glad to see I’m not the only one who finally got a Kata right. I want to know which is track in which you throw two punches with the same arm and then a cross with the other arm. I know its from this release but i can’t place it. Track 5. head body head. Passenger. Sorry. Track 3 I mean.